Invite your little one to make her own mini Christmas stocking with this cute printable template! She can add some holiday colors, and soon she'll have a homemade stocking that can be filled with treats. 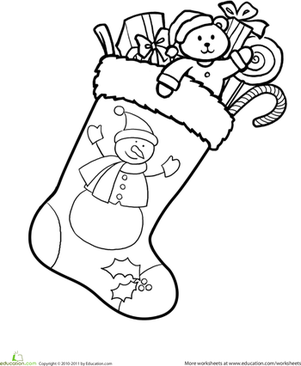 Get your child into the festive spirit with this Christmas stocking coloring page. It features a stocking that's positively bursting with fun gifts! This Christmas stocking coloring page features a stocking brimming with gifts! Add the finishing touches to this Christmas picture with crayons! This festive Christmas coloring page features a Christmas stocking stuffed full of surprises from Santa. Create your very own mini Christmas stocking! Little ones can color and construct their own stocking, and soon they'll be ready to receive holiday treats. Follow the color-by-number guide to bring color and Christmas spirit to this stocking coloring page. Your child can complete this Christmas dot to dot by connecting the dots in order. Then, she can enjoy coloring the stocking her favorite holiday colors. 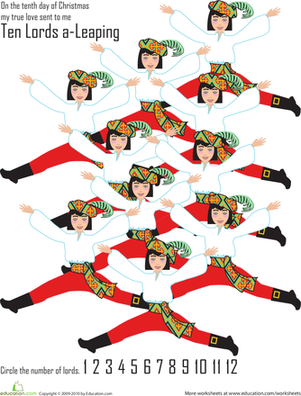 Kids can get into the holiday spirit by making some printable Christmas decorations. Making this festive centerpiece is a good winter-break activity. Your child can help write out a Christmas message and sign his name. 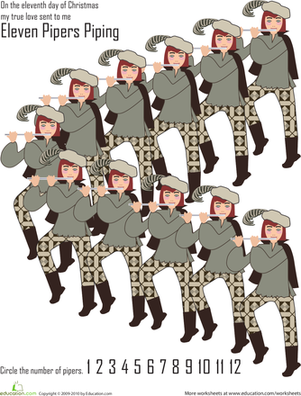 This fun printable shows the 10th day in this classic Christmas song.